Broadway runs diagonally through the street grid in Manhattan, creating both irregular intersections and room for world-class public spaces. Prior to this project’s changes, Broadway was congested with vehicles that were forced to idle as it converged with congested avenues. At the same time, too many pedestrians were forced onto too little sidewalk, which resulted in an unpleasant working and shopping environment, and pedestrians unsafely walking on the roadbed. The NYC Department of Transportation (NYC DOT) determined that reconfiguring this corridor to focus on the needs of its teeming pedestrians would result in safety, livability, and mobility benefits. NYC DOT’s study predicted that removing vehicle traffic lanes, limiting turns, and closing the entire street to vehicles in places would provide much needed pedestrian infrastructure and actually reduce gridlock and improve area-wide travel times. Beginning in 2009, New York City made changes to the design of Broadway and nearby streets, first with temporary low-cost treatments, and then with permanent designs once the benefits of the changes had been confirmed. These changes were made to roughly 2.3 miles of Broadway, from Union Square at 14th Street, north past Madison Square Park, Herald Square, and Times Square, all the way to Columbus Circle at 59th Street. In the process, NYC DOT transformed many of the most iconic and highly frequented areas in the city. This project involved changes not just to Broadway itself, but also to nearby streets, in order to implement an area-wide transportation network overhaul that involved adjusting turning lanes, parking regulations, and signal timing. 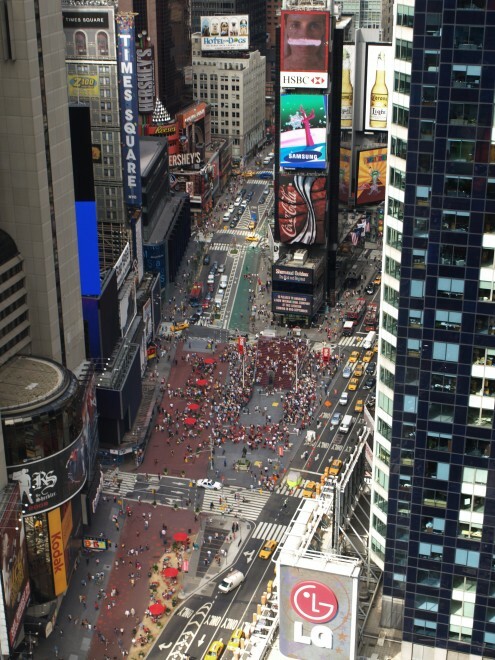 In one of the most dramatic changes to the corridor, Broadway was completely closed to vehicle traffic at Times Square and Herald Square, which created room for new pedestrian plazas and spaces, and allowed for longer signal times for vehicles at the adjacent avenues. More permanent, capital-intensive designs are forthcoming for many areas of the project. These designs will include modifications to correct issues with the original redesign. The project was completed in two major phases. Broadway north of 23rd Street was reconfigured in 2009, while Broadway between 14th Street (Union Square) and 23rd Street was remade in 2010. Intersections simplified by closing some or all of Broadway to motorized traffic where it intersects other avenues, and creating or altering pedestrian crossing signal phases. 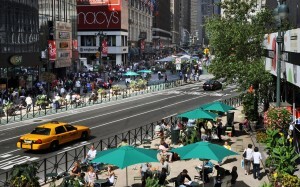 Pedestrian plazas with street furniture created at Times Square, Herald Square, and Madison Square Park. Bike lanes added that are in many places separated from vehicular traffic. Two moving and two parking lanes with an on-street bike lane reconfigured to create one moving and two parking lanes with a median-protected bike lane on Broadway. East 17th Street converted from a two-way street to a one-way street, with bike and pedestrian lanes added, separated from traffic by planters. Pedestrian plaza created on former street space, by extending the sidewalk corner at Broadway and East 17th Street where turns were no longer possible. Bike and pedestrian facilities upgraded throughout this section, including traffic-separated bike lanes and shorter crossing distances at intersections created by constructing neckdowns and refuge islands. Signal and turning regulation changes in order to optimize traffic flow for new street conditions. NYC DOT carefully tracked before-and-after data on the project, and found that the changes to Broadway successfully improved traffic flow and increased safety, while creating new space for pedestrians and bicyclists. The measurements collected by the agency are too exhaustive to fully explore here, but they included tracking safety by mode, traffic volumes by mode, satisfaction surveys, and area-wide trip times using on-board taxi GPS data and travel-time surveys. Point to point travel times improved by 17% in northbound trips in West Midtown, and 8% in East Midtown. East and West Midtown southbound times improved 3% and slowed 2% respectively, whereas crosstown trips showed westbound improvements of 9% and 7% in East and West Midtown and eastbound improvements of 5% and 2% in East and West Midtown. Motorist and passenger injuries decreased by 63%. Pedestrian volumes increased by 11% in Times Square and 6% in Herald Square, and the pedestrians in those locations lingered longer. Pedestrians entered travel lanes less, as the project provides sufficient sidewalk and plaza space. Vehicles speeding over the 30 MPH limit declined from 28% to 12% of all vehicles on Broadway between 19th and 20th streets. Bicycle volumes increased 16% on weekdays and 33% on weekends. The combined southbound traffic volume on Park Ave and Broadway together was maintained. Median speed for trips taken on 18th Street within the project area (6th Avenue to Irving Place) improved by 14%. Speeds on Park Avenue remained relatively unchanged in both the northbound and southbound direction. 74% of area survey respondents liked the new traffic configuration and 20% of business owners/managers thought that it had improved business, while none stated that it adversely affected their business. Well Documented: This may be the most discussed rightsizing project in the United States in recent years, and it is copiously documented in popular media and on NYC DOT’s website. 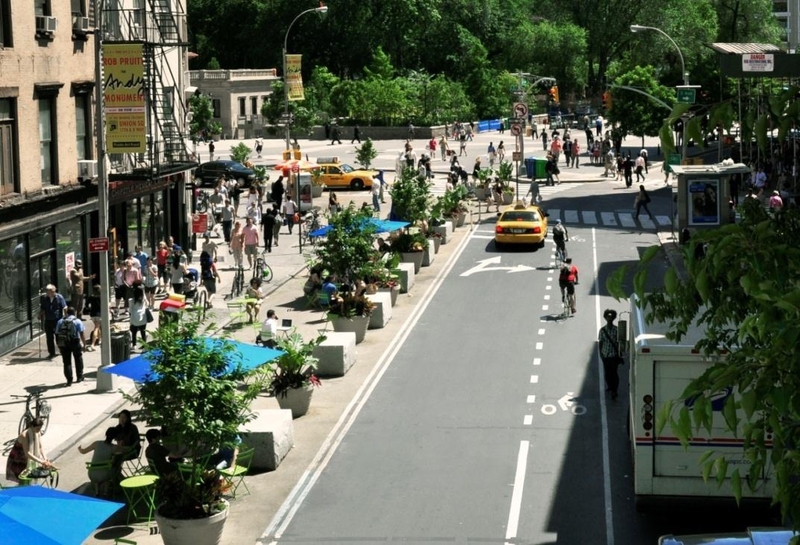 Business Improvement Districts worked with NYC DOT as partners at all of the major avenue intersections to help design and manage the new public plazas, to administer surveys evaluating changes, and to communicate with area office and retail interests. Public Process: Stakeholders, including relevant communities, industries, and elected officials were consulted, and their input shaped the final plan.